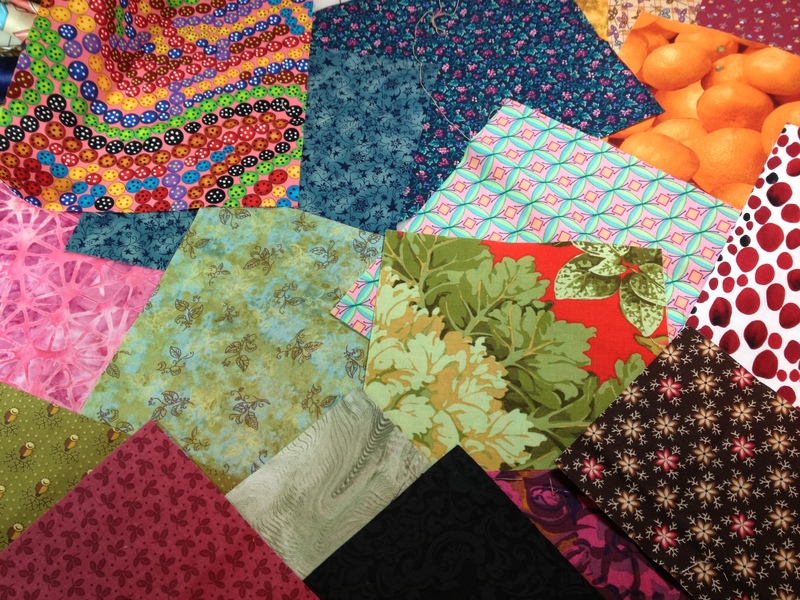 Back in April we signed up for a challenge at Evergreen Quilters – we were given 21 8″ blocks. I wrote about it here – https://quiltingonthecove.com/2013/04/03/faith-in-me/. I had an idea of what I wanted make but I have to admit that I procrastinated for over a month and then I started cutting and paper piecing the background. I used my Electric Quilt program to print up several various 4″ log cabin blocks. My plan was to use the fabrics to make a background for my garden. 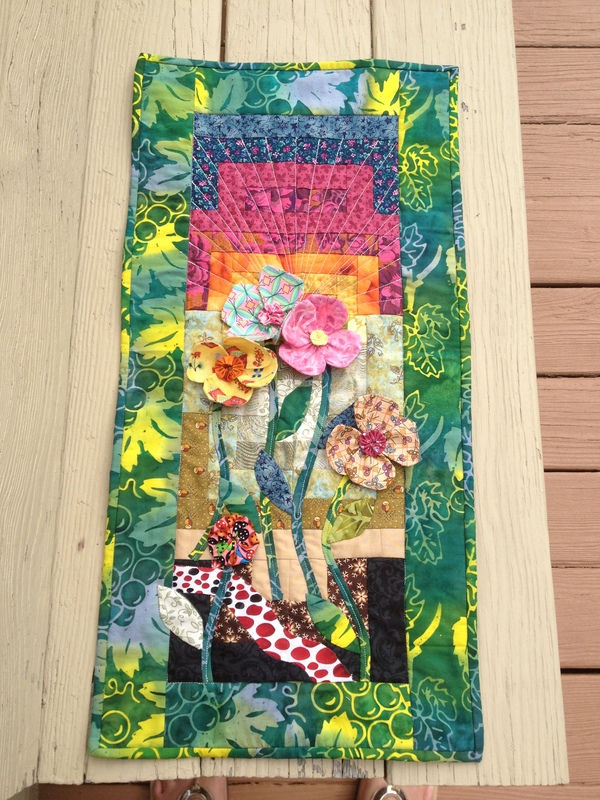 The lower part of the quilt is the ground and the steps into the garden. There is a stone path and as your eyes work upward the sun is setting. I was thinking of a fall sunset with all of the reds and oranges as the sun goes down. 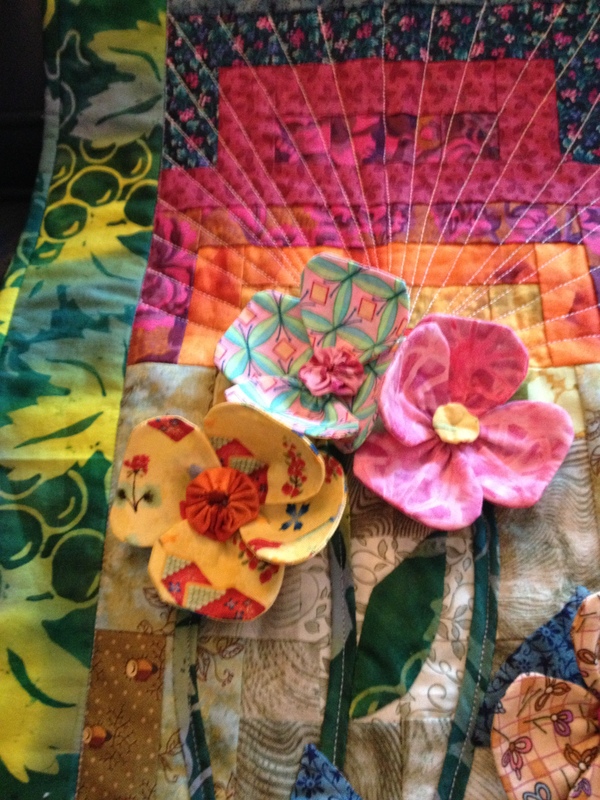 Ok, so you may need to use your imagination but that is what creating a quilt from a disjointed pile of fabrics is about. I added bias cut stems and 3 dimensional flowers. I am really pleased with the final outcome. I neglected to take a picture of all of the wonderful creations that my fellow quilters made. Silly me, but they were amazing!!! I have a ton of projects in the pipeline – several with deadlines. So I will be very busy in the next few weeks. I also have pickles to pickle and salsa to make so it will be a crazy few weeks. Life is good – fall is coming and I am ok with it all. ← Too many cherry tomatoes….